Welcome to F1Minute - Red Bull complete Indian demonstration with Daniel Ricciardo. Following in the footsteps of McLaren, who completed a demonstration around the streets of Bangalore, Red Bull have also given the Indian fans a treat. 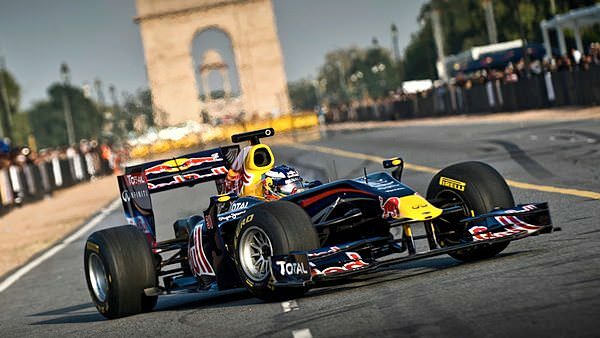 The team took their junior driver Daniel Ricciardo to New Delhi, giving him the opportunity to drive the Red Bull Showcar down the Rajpath - an iconic ceremonial boulevard. Daniel’s current team, HRT, have confirmed that Narain Karthikeyan will be driving their car in Free Practice in Japan this weekend, to prepare for his participation in the inaugural Indian race. He’ll take Tonio Liuzzi’s seat, leaving Ricciardo with a full weekend.